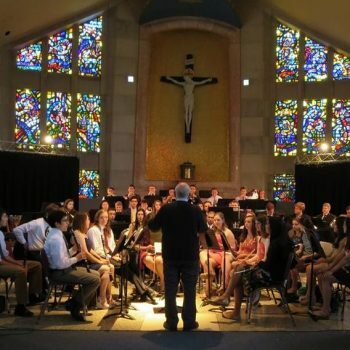 The Villanova Band is unique in its structure, operating as the University’s Pep Band, Scramble Band, and Concert Band all in one. The Villanova Band is one of the oldest and largest student organizations on campus. We perform at a variety of university functions throughout the year, including the St. Thomas of Villanova Day of Service, Special Olympics Pennsylvania Fall Festival, and Commencement. The band is most visible and well-known for its performances at Villanova Men’s and Women’s basketball games, but that is not all we do. The Band also functions as a Scramble Band, performing at home football games, and as a Concert Band, performing a concert at the end of each semester. Being a member of the Villanova Band is an exciting and rewarding experience which fosters friendships and provides experiences that last a lifetime. The Band plays a wide range of music from various time periods. These include pieces from the Classical and Romantic eras, marches, and modern wind ensemble pieces. The Band functions as a Concert Band at university functions such as the ROTC Commissioning and Commencement. We usually perform at two concerts per year: a Winter Concert at the end of the Fall semester and Spring Concert at the end of the Spring semester. These concerts are free and open to the public. The band is most visible when playing at basketball games. We play a wide variety of music, ranging from Dixieland-inspired jazz pieces to contemporary pop pieces, all of which are chosen by our student-leader Pep Band Directors and Drum Majors. 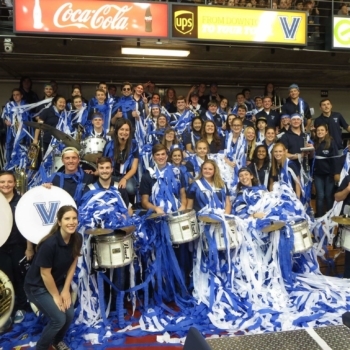 Traditionally, Villanova Band members have been among the most avid basketball fans at school. We provide entertainment and are an integral part of the Villanova school spirit. We attend all home games, as well as a select number of away games, and we also have the opportunity to travel to Big East and NCAA Tournaments to support the teams. 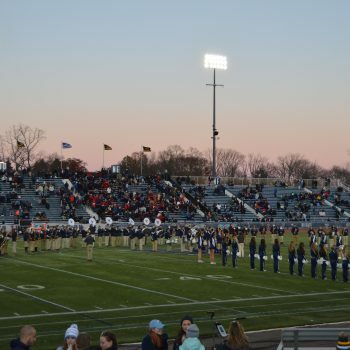 During Villanova home football games, the band functions as a Pep Band in the stands, much like at basketball games. But at Half-time, the band puts on a field show. These shows consist of songs that have a certain theme, along with related formations to help illustrate the particular theme. Due to the size of the Band and the varying levels of marching experience of our members, we “scatter” to formations between songs in a format known as a “scramble band.” The Band is led entirely by our student-leader Drum Majors for Tailgate before the game, in the stands during the game, and on the field during Half-time.